Monarch Specialties I 7051 - Filing cabinet - 3 drawer/ white/ cement-look on castor Finished in a sophisticated White and a cement-look Top with stylish silver plastic drawer pulls. Put the extra in extraordinary with this 3 drawer filing cabinet on 5 castors ! add this multi-functional filing cabinet, finished in White with a grey cement-look Top, books or other decorative items, to any desk or table to create more storage in your home office. Whether tucked under a desk or placed on the side for a printer, papers, this Filing cabinet can be the little extra you needed in your office space. Three spacious storage drawers. Accented with simple modern silver colored handles, the Top two drawers are useful for files, books while the bottom drawer can fit standard or legal sized hanging folders. 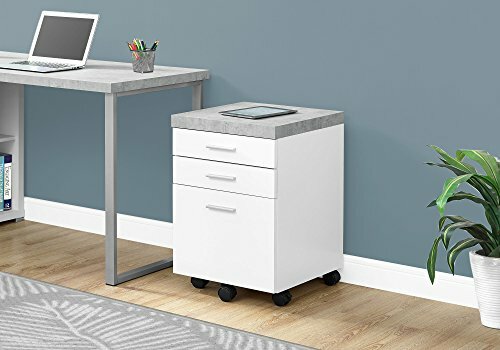 Monarch Specialties I 7051 Filing Cabinet White 18.25" L x 17.75" D x 25.25" H - Includes 5 castors for ease of mobility 2 locking, 3 Non-Locking. Bottom drawer fits standard and legal sized folders. Monarch Specialties I 7307 - Extra long "l" shaped corner computer desk in a modern design. Sleek and contemporary, this extra-long L shaped corner computer desk is the perfect combination of function, durability and design in a modern form. Drawers can conveniently be assembled on the left or right Hand sides. Featuring two large storage drawers and a file drawer to help keep you organized, which can conveniently be assembled on the Left or right hand side, with plenty of desktop surface for your all your working needs. Finished in a chic grey cement-look top with White on all sides, this work station with the thick floating tops and sleek track metal legs adds pizzazz with practicality to any home office. This highly functional desk is a must-have for any home business! Sturdy silver metal track legs for a clean contemporary look. Monarch Specialties I 7307 Computer Desk Left or Right Facing White / Cement-Look 70"L - Chic two-tone grey cement-look Top and White Finish on all sides. 2 large storage drawers and 1 large file drawer standard/legal for office essentials. Monarch Specialties I 7288 - 2 large storage drawers and 1 large file drawer standard/legal for office essentials. Cabinet dims: 17. 5"lx14. 25"dx25. 25"h; top two drawer: 16. 25"lx13. 25"dx4"h ; bottom drawer: 16. 25"lx13. 25"dx1025"h; shelf dims: 17. 5"lx14. 25"dx7. 5-17. 5"h. Sturdy silver metal track legs for a clean contemporary look. Drawers can conveniently be assembled on the left or right Hand sides. This white finished desk with a grey cement-look top can be configured on the Left or right hand side, making it the perfect combination of function, durability and design in a modern form. Use the spacious top for your computer desk top, laptop or tablets. Extra long "l" shaped corner computer desk in a modern design. Monarch Specialties Computer Desk - 60"L White / Cement-Look Left/Right Face - Chic two-tone grey cement-look Top and White Finish on all sides. Sleek track metal legs and large thick paneled work surface. Featuring 2 open concept shelves, 3 drawers and a cabinet accented by silver colored drawer pulls, help keep your office supplies and documents organized and desktop clutter free. This simple yet practical "L" shaped desk will be the perfect addition to your home office. Contemporary industrial inspired design in a two-tone grey cement-look and White Finish. Monarch Specialties I 7258 - Cabinet dims: 17. 5"lx14. 25"dx25. 25"h; top two drawer: 16. 25"lx13. 25"dx4"h ; bottom drawer: 16. 25"lx13. 25"dx1025"h; shelf dims: 17. 5"lx14. 25"dx7. 5-17. 5"h. 2 large storage drawers and 1 large file drawer standard/legal for office essentials. Chic two-tone grey cement-look Top and White Finish on all sides. Use the spacious top for your computer desk top, laptop or tablets. Drawers can conveniently be assembled on the left or right Hand sides. Contemporary industrial inspired design. Sleek track metal legs and large thick paneled work surface. This simple yet practical "L" shaped desk will be the perfect addition to your home office. This two tone finish desk which can be configured on the Left or right hand side is the right combination of function, durability and design in a modern form. Monarch Specialties I 7258 Computer Desk Left or Right Facing White / Cement-Look 80"L - 1 file drawer accommodates standard or legal sized documents 13. 5"lx17"dx1025"h. Sleek track metal legs and large thick paneled work surface. Featuring 3 closed storage drawers, 2 open shelves and 1Cabinet. Monarch Specialties I 7066 - Sleek track metal legs and large thick paneled work surface. Drawers can conveniently be assembled on the left or right Hand sides. Contemporary industrial inspired design. Cabinet dims: 17. 5"lx14. 25"dx25. 25"h; top two drawer: 16. 25"lx13. 25"dx4"h ; bottom drawer: 16. 25"lx13. 25"dx1025"h; shelf dims: 17. 5"lx14. 25"dx7. 5-17. 5"h. Extra long "l" shaped corner computer desk in a modern design. Additional upper storage space. Sleek track metal legs and large thick paneled work surface. Stylish and functional, this chic, white hollow-core storage credenza will add modern appeal to your home office. 3 spacious storage cabinets with adjustable shelving. Monarch Specialties White Hollow-Core Office Storage Credenza, 48-Inch - This durable credenza features a large work surface and silver accents that give an ultra contemporary feel. Chic white finish. With 4 deep drawers and additional upper storage space, this credenza will create an organized and fashionable feel in your office. Two storage drawers. Furmax - Contemporary industrial inspired design. Chic two-tone grey cement-look Top and White Finish on all sides. Stylish and modern silver accents. Great for all offices, with its white leather, allows you adjust up to 20 degrees-with no traditional seat or back board used, including home offices, the Furmax executive style chair suits the most professional of workspaces, ribbed design and mid back*Features: -Fully adjustable height with 360-degree swivel rotation-Heavy duty base with Wheels -Casters can avoid scratch on floor board-Adjustable tilt tension control, this chair provides long lasting support and comfort-The ergonomic design can relieve your tired feeling and pressure during long workdays*Specifications: Load capacity: 280 LBSSeating area Dimension: 19. 7"x19. 1" w x dbackrest dimension: 18. 1"x25. 7" w x hadjustable seat height: 16. 7-19. 9 inchesoverall Dimension: 25. 8" x25. 8" x39. 3-42. 4" w x d x h*package includes:-office chair-installation Hardware-Installation Tool-Installation Manual Extra long "l" shaped corner computer desk in a modern design. Anji Yibang Furniture Office Chair - Adjustable height task chair: pneumatic controls let you easy raise or lower your seat to be suitable height with your computer desk. Extra long "l" shaped corner computer desk in a modern design. Sleek track metal legs and large thick paneled work surface. Upgraded seat: 3. 15 inches thick padded seat for comfortable seating. Can conveniently be Placed on the left or right side offering you multi-functionality. 2 large storage drawers and 1 large file drawer standard/legal for office essentials. Material: the smooth, pliable Leather surface with ribbed stitching detail gives an upscale, luxurious feel. Fit for home task, meeting room, office, receptions and banking use. Grey Modern Office Chair Computer Desk Chair Comfort White Swivel Fabric Home Office Task Chair with Arms and Adjustable Height, Suitable for Computer Working and Meeting and Reception Place - 1open cubby 15. 75"lx22. 25"dx4. 5"h and 1 closed storage drawer 13. 5"lx17"dx4"H. Strong metal base in white powder coated with 5 wheels, it will let you easy to move in your room. Contemporary industrial inspired design in a two-tone grey cement-look and White Finish. Sleek track metal legs and large thick paneled work surface. eHomeProducts COMINHKR079668 - 1 file drawer accommodates standard or legal sized documents 13. 5"lx17"dx1025"h. Stylish and modern silver accents. 3 spacious storage cabinets with adjustable shelving. Material: the smooth, pliable Leather surface with ribbed stitching detail gives an upscale, luxurious feel. Two storage drawers. This functional side table has a beautiful white finish and chrome finish legs. Upgraded seat: 3. 15 inches thick padded seat for comfortable seating. Contemporary industrial inspired design. Sleek track metal legs and large thick paneled work surface. 2 large storage drawers and 1 large file drawer standard/legal for office essentials. Cabinet dims: 17. 5"lx14. 25"dx25. 25"h; top two drawer: 16. White Finish Chrome Chair Side End Snack Table - 25"lx13. 25"dx4"h ; bottom drawer: 16. 25"lx13. 25"dx1025"h; shelf dims: 17. Mounting Dream FBA_LYSB00SFSU53G-ELECTRNCS - Fits 26-55" tus this mount fits most of 26-55" Tus sold today. Heavy duty steel construction, 99 lbs. 1open cubby 15. 75"lx22. 25"dx4. 5"h and 1 closed storage drawer 13. 5"lx17"dx4"H. Considerate Design for Allen Key Storage. 2-tier of shelf. Strong metal base in white powder coated with 5 wheels, it will let you easy to move in your room. 3 spacious storage cabinets with adjustable shelving. Adjustable height task chair: pneumatic controls let you easy raise or lower your seat to be suitable height with your computer desk. Fit for home task, office, meeting room, receptions and banking use. Extra long "l" shaped corner computer desk in a modern design. Mounting Dream TV Wall Mounts TV Bracket for Most 32-55 Inch Flat Screen TV/Mount Bracket, Full Motion TV Wall Mount with Swivel Articulating Dual Arms, Max VESA 400x400mm, 99 LBS Loading MD2380 - 2" from the wall with articulating arm, This mount retracts to 3"to wall to save space, and extends up to 15. Comfy computer office chair: Super breathable fabric material for good skin touch, 360 degree swivel and tilt option for extra relaxation. Hemi cable supports 3d, ethernet, 1440p and audio Return conforming to latest HDMI 1. Finish: White and Chrome. Weight capacity: 220 lb. Materials: Wood and Metal.